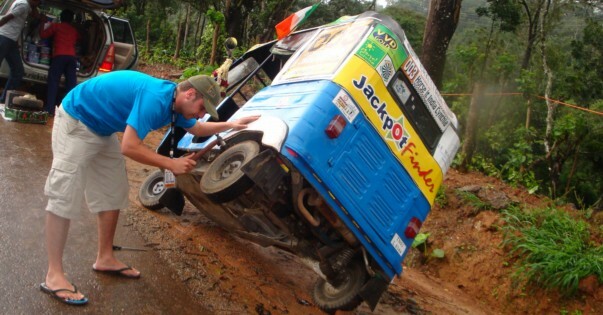 Amazing India on three wheels! Welcome to the Rickshaw Challenge where you will find a spectacular choice of trips involving everything that India has to offer, all from the driving seat of an auto rickshaw! The adrenaline flows from the moment the flag drops and will be with you long after you reach the finish line for the closing party. On the way you’ll encounter anything from desert heat to monsoon rains, jungle tracks to great plains, and golden beaches to golden palaces, all safe in the knowledge that you are being supported by India’s longest established and most experienced rickshaw adventure company on this tuk tuk adventure! Check the trip calendar for availability or contact one of our travel experts for advice and start your tuk tuk challenge now! Who better to tell you about the experience than those who've already joined the exclusive club of Rickshaw Challenge Veterans. Did you know we also provide rickshaw rentals for individuals and groups who wish to put together their own itinerary whilst in India? It's like your own taxi!